Eriegardless Sportfishing offers Lake Erie Fishing Charters for both walleye and perch. Ohio's Western Basin of Lake Erie offers anglers many great opportunities for both walleye fishing and perch fishing. In fact, Port Clinton is known as the walleye fishing capital of the world! It should be noted that we are located in Lakeside Marblehead, Ohio, right next to Port Clinton. Furthermore, we have immediate and quick access to Lake Erie. Therefore we can keep you on the fish the entire season with minimal runtime resulting in more fishing time for you and your crew. Additionally, If you’re looking for fishing charters for Lake Erie, we offer a wide option of charter packages. We can welcome aboard up to 6 people. Our trips run for either 8 hours or when you reach your limit of fish. Our priority is ensuring you have a great experience with us, and catching fish is the bonus. Obviously we enjoy our time with our customers, so we are not a charter that tries to get you back to the dock the fastest. Most importantly, our goal is to have happy, repeat customers! Check out our Lake Erie fishing charter Rates & Packages! The Best Walleye Fishing in the World! 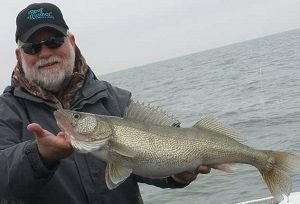 Eriegardless Sportfishing offers fishing charters on Lake Erie for walleye starting in early April. At that time we fish around the reef complex in the Western Basin. This early fishing, without a doubt, is "Trophy" walleye fishing season for Lake Erie walleye trips. For that reason our walleye trolling trips focus on pre- and post- spawn females during the early Lake Erie fishing charter season. Subsequently, many Lake Erie walleye caught at this time will qualify for Fish Ohio, at a minimum length of 28 inches! Therefore, booking a charter during this time offers the best chance to catch a fish of a lifetime! The walleye fishing season continues, however, even after the females head east after the spawn. The Western Basin hold resident walleye all year due to all the structure and abundant of bait. Because of this, fishing the Western Basin offers ample opportunities for catching walleye all summer. In short, booking a charter trip with Eriegardless Sportfishing will provide anglers the opportunity to catch their limit of walleye throughout the fishing season. Eriegardless Sportfishing also offers charters in the Western Basin for perch. Perch fishing on Lake Erie is enjoyable for experienced fisherman as well as beginner fisherman. In contrast to walleye, the best time for perch fishing begins in August and runs through end of season in October. Moreover, each licensed fisherman can catch up to 30 perch per day on our Lake Erie perch fishing charter. Book a Lake Erie perch fishing charter with Eriegardless Sportfishing for a truly memorable experience! Most importantly, for the ultimate experience, book a Combo trip that offers a full day of both walleye fishing and perch fishing! Lake Erie Walleye Fishing Charters at its Best! At Eriegardless Sportfishing, you have the opportunity to be involved in everything we do. For example, you will learn how and why we do what we do while trolling for walleye. As a result, you will learn what makes Lake Erie the Walleye Capital of the World! Overall, we are dedicated to doing everything we possibly can to make your charter the best it can possibly be. We offer unique fishing trips because we are focused on providing with you an experience that you will remember. Our charters are not just trips to catch your fish and get back to the dock as fast as possible. Ultimately, taking a charter with us is about your experience and making lifelong memories. For this reason our fishing trips set the standard for both Lake Erie walleye and perch trips. Co-Owner and Operator, USCG Captain Kelly was introduced to fishing at an early age thanks to his father and grandfather. Since the age of 5, Kelly has always had a passion for fishing that led to the discovery of walleye fishing on Lake Erie in the early 90's. 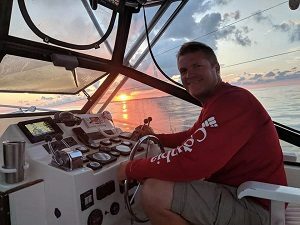 With over 20 years of experience fishing the Western Basin of Lake Erie, Kelly took his passion of fishing and created Eriegardless Sportfshing - Lake Erie Fishing Charters. Now he shares that same passion, drive, and experience with his customers. You will not find a harder working and more dedicated Captain. Co-owner, wife, and First Mate Stacie began her walleye fishing in 2014 after meeting her husband. Stacie soon realized all that Lake Erie Fishing has to offer. 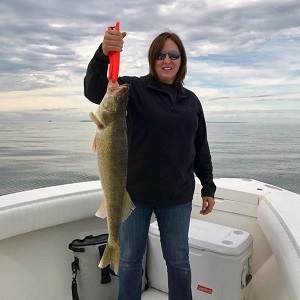 She picked up on the techniques and skills needed for trolling for walleye and perch fishing very quickly, and was well on her way to being a First Mate for Eriegardless Sportfishing! Her knowledge and teaching ability is a great asset to our charters to make your day memorable! Just don't challenge her to a perch catching contest!! Since 1962, Jim has been fishing for walleye on Lake Erie with most of his fishing experience being in the Western Basin. Jim has participated in most all major Lake Erie Walleye Tournaments in the Western Basin since 1979. Jim has fished in over 100 walleye tournaments, has won 13 tournaments and 38 top ten finishes. Booking now for the 2019 season. Walleye population has rebounded tremendously as a result of the exceptional hatch in 2015, 2016 and 2018! Ohio Department of Natural Resources is estimating 100 MILLION legal sized fish in Lake Erie. Hatch in '18 was the 2nd best "EVER" recorded. Our Lake Erie walleye fishing charters begin in April and run through Oct. The season starts out chasing large females as they enter and leave the Reef Complex located near Port Clinton. As the water warms and season progresses we will begin moving to the east and deeper water. After that, we finish our season fishing near Huron, Ohio. 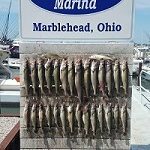 Being located in Lakeside Marblehead, Ohio gives us access to prime walleye fishing "Eriegardless" of the time of year! Perch fishing remains steady in the Western Basin. According to ODNR, average to better hatch over last several years continues to keep perch population at good numbers. Perch size of fish has been better in '17 and '18 for the Western Basin. 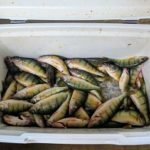 Look to start perch fishing after July 4th weekend with best opportunities for limit catches of Perch mid-August through Oct.
We are centrally located in Western Basin of Lake Erie in Lakeside-Marblehead, Ohio. Our location in West Harbor on Catawba Island allows us quick and easy access to year round fishing, Lake Erie's islands, and all that there is do in Ottawa County and the Port Clinton area. Spending your vacation or a weekend on Kelley's Island, Put-n-Bay or one of the other islands and would like to take a fishing charter or maybe just a sunset cruise? No worries, we would be glad to pick you up and let you enjoy your trip with us and then return you back to your location. If you are on a fishing charter and would like to keep the fish, we offer fishing cleaning services provided by Bay's Edge Fish Cleaning. They will hold and even freeze your fish until you return from the islands for pickup. Interested in adding some great memories that you will never forget while staying on the islands? Give us a call! We take great pride in providing you the best experience possible. At the end of the day its about "You" and your group/family and the memories that will last. Nothing makes us happier than to see you smile, excited, and can't wait to come back. We are not just a charter that takes you out, catches your fish, and takes you back to the dock. It's an experience for us as much as it is for you. Check out our reviews at these links. Give us a shot, we are positive that you'll be glad you did! We have partnered with several locations in the area that can provide a great place to stay for you and your group. Prices are very reasonable and some locations can accommodate your entire group in a fully equipped condo. We also can arrange a couple local cabins and houses but these go quickly so call as soon as possible. First time taking a charter or first time booking a trip with us? Please view our list of items you should bring with you! 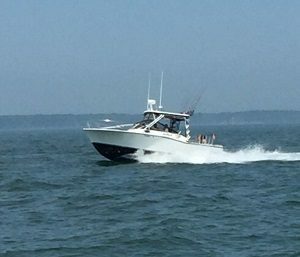 Our boat is a 28' Carolina Classic with a full enclosure and private head to make your day very comfortable even on Lake Erie's worse days. Our boat is also fully setup for walleye trolling, capable of running up to 16 rods, autopilot, radar, 2 - vhf radios, and plenty of deck space for you and your group. We are docked in Anchor's Away Marina which is centrally located in the Western Basin and give us great access to the fish through out the entire season.